It’s been quite a while since my last post, but I’ll make up for it by writing three new posts this weekend for you to read. Naples, Oktoberfest, Greece & More! It’s sad to admit, but I’m now roughly halfway finished with my semester in Rome. The reality hit while craming for midterms… But if the second half of my semester is as great as the first half has been, then I surely will have plenty more good things to report! Will Steffek is a Loyola University Chicago Quinlan School of Business student studying aboard for an entire year. He is a recipient of the Ricci Scholarship and will be in Rome for fall semester and Beijing for spring semester. He is a junior majoring in International Business and he just completed a summer internship with Robert Bosch Tool Company. 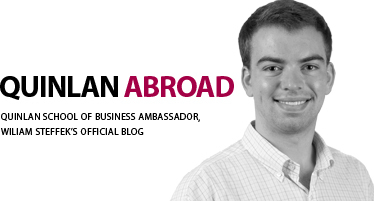 He hopes to share his experiences abroad to provide insightful information to Quinlan students.